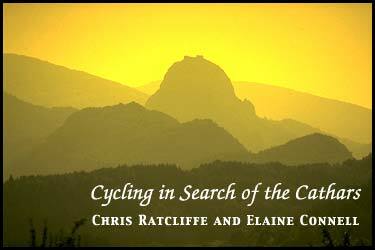 Elaine Connell and Chris Ratcliffe spent four months cycling in the mountains and valleys of South-west France, gathering material and experiences for writing their book, Cycling in Search of the Cathars. The Cathars were medieval heretics who became very influential in Languedoc, as that area of France was then called. Many of their ideas have echoes in modern times: they were vegetarian, thought women should be treated the same as men, were against war and violence and believed in reincarnation. In the 13th century, Crusaders were sent by the Roman Catholic Church to wipe out all Cathars. Much of the tourist industry of the eastern Pyrenees (and the neighbouring areas of Ariege, Aude and Haute Garonne) centres on historical connections with the Cathars. Yet there is very little written in English about these heretics. Their investigation into the Cathars has persuaded them that much has yet to be discovered about the early days of Christianity. "Christianity as it has been passed on by the churches is basically a set of ideas that the Roman Empire found it convenient to promote. The Cathars may well have been in contact with a more authentic tradition of Christianity, writes Chris Ratcliffe. Their book, while rehearsing some of the discomforts of cycling when you have to end the day in a tent, deals with remarkable history of the area, with its fortified hill-top towns and villages built to protect the medieval Cathar heretics and to offer some resistance to the bloodthirsty crusade by Simon de Montford.